← February Garden Club Flower Show: The Blue Ribbon Designs! 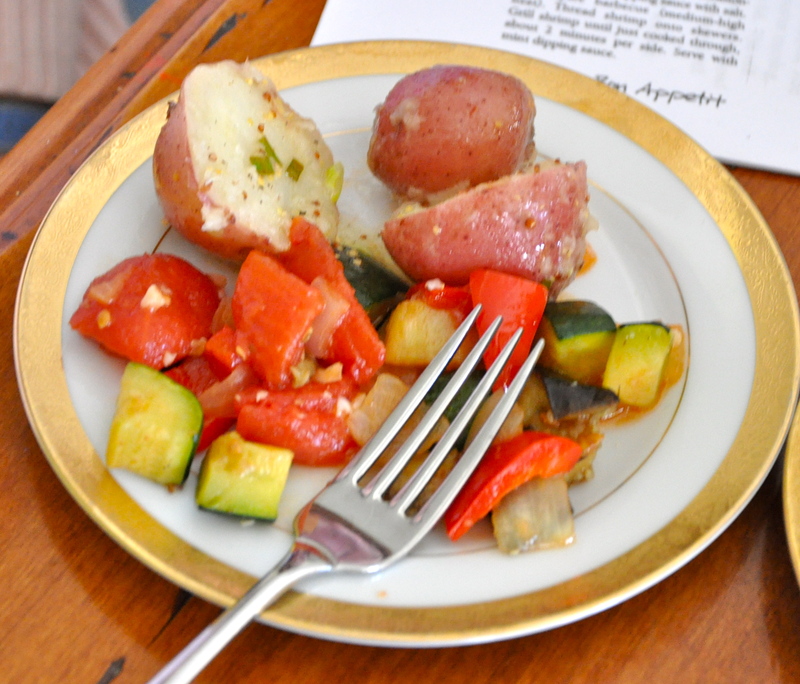 Two of the six dishes we sampled today. Today a great group of garden club women got together at Cynthia’s home for a club-sponsored demonstration: “Cooking with Herbs.” Debbie, a former professional chef and garden club force, chopped, flipped, stirred and whirred her way through five different herb-filled dishes and we sampled a sixth (Butternut Squash Puree with Thyme) that she deemed “too easy” to take the time to demonstrate for us; instead, we just ate it! 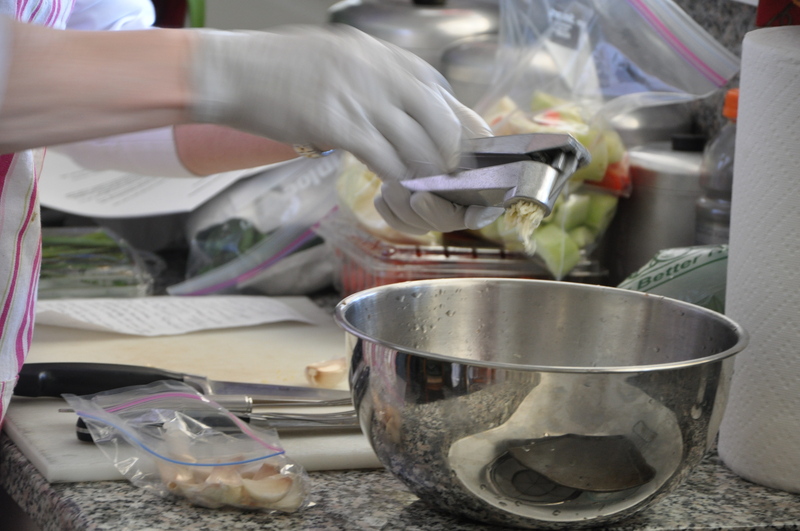 Debbie firmly believes in using the freshest possible ingredients to ensure the best possible end result. 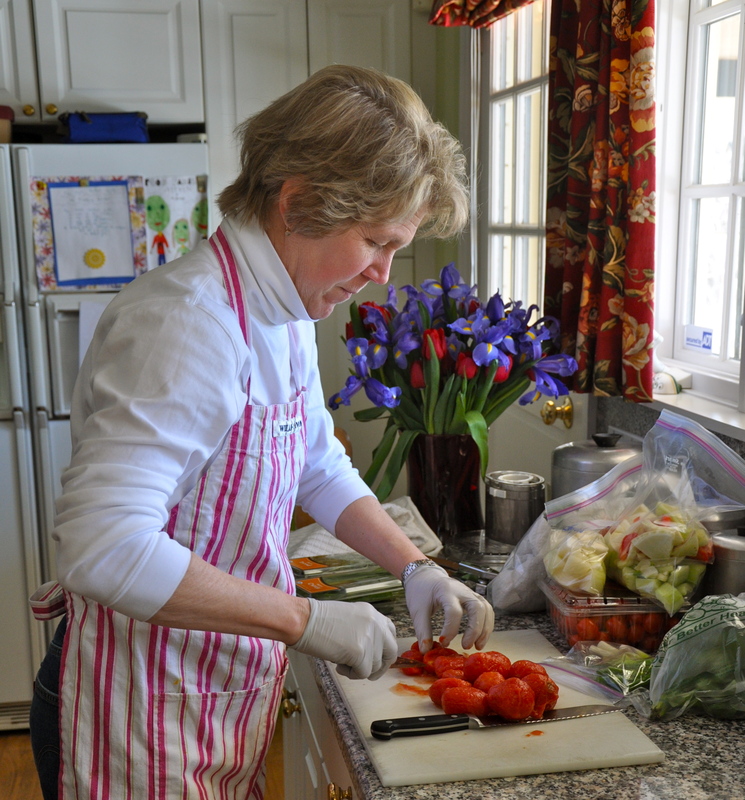 I really appreciate that she chose recipes that are easy to prepare and appeal to a broad range of taste buds; in addition, virtually all of the ingredients are easy to find in our local food stores! 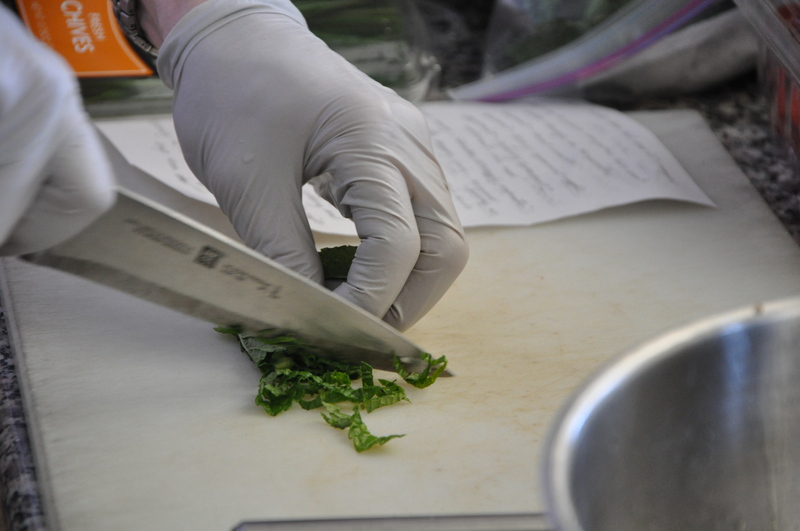 The fresh herbs in this dish really make the veggies's flavors "pop." 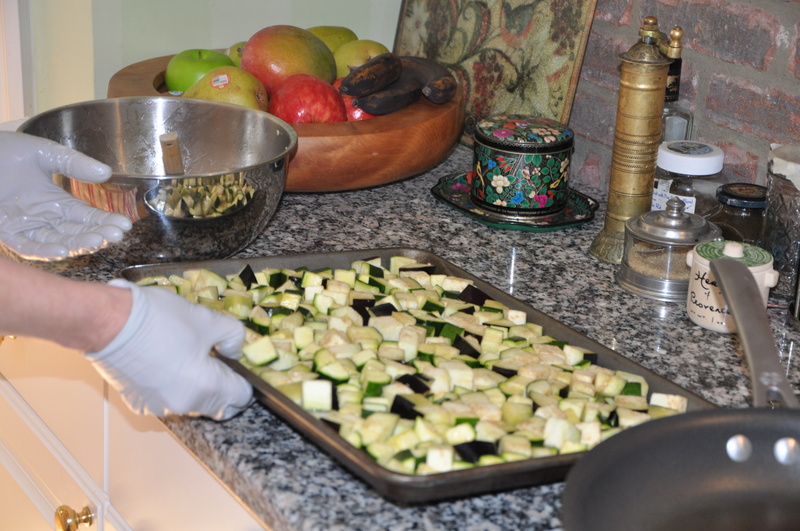 Using a relatively small dice, chop eggplant and zucchini and placed on an oiled sheet pan in the oven to roast. 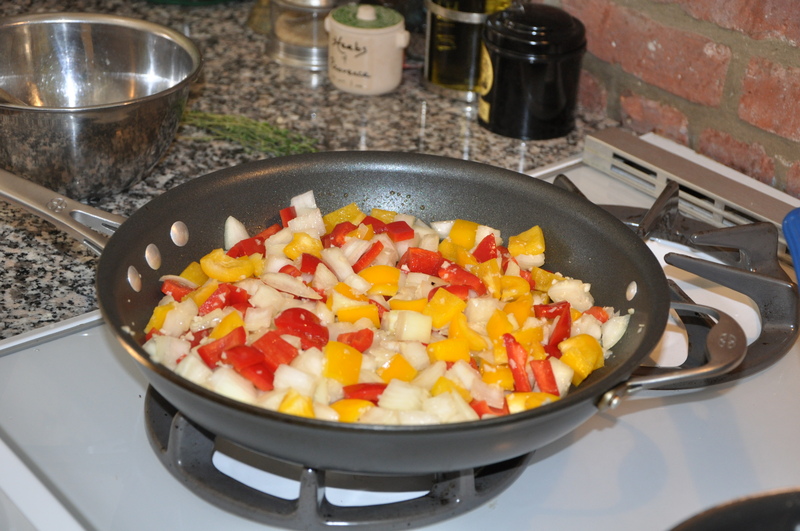 Meanwhile, saute onion, garlic and bell pepper on the stovetop. 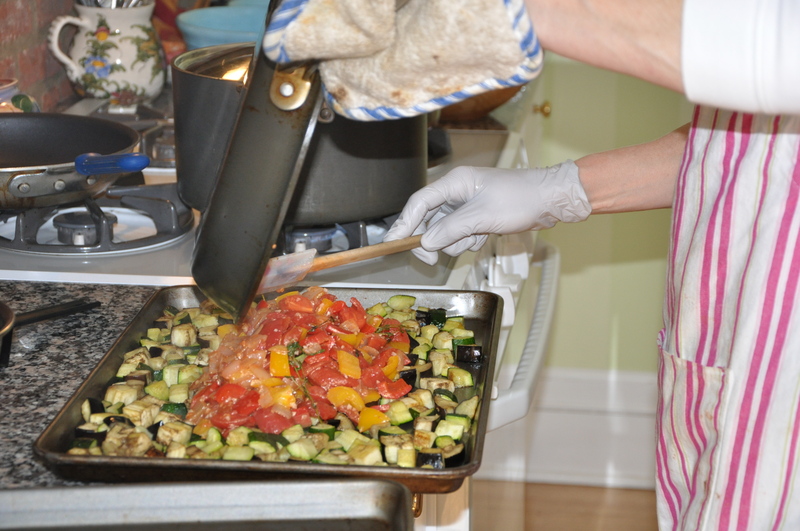 Deb suggests using canned San Marzano tomatoes this time of year; she's chopping them up. 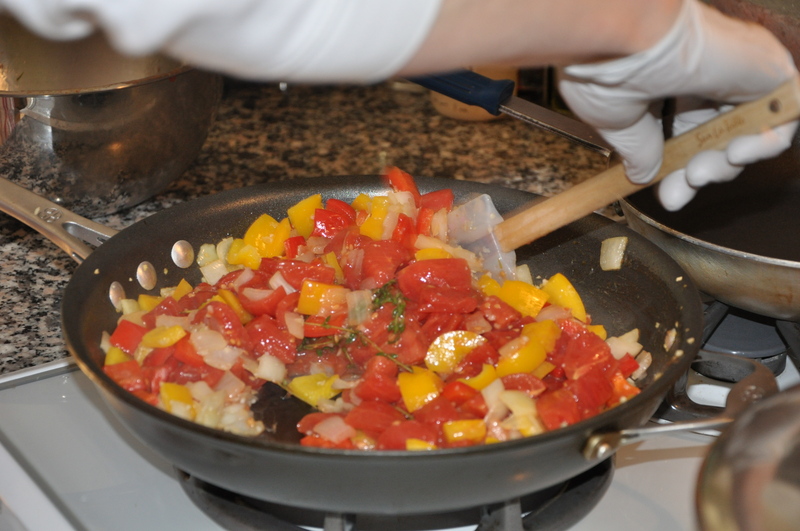 Add the San Marzanos to the stovetop saute and continue cooking. 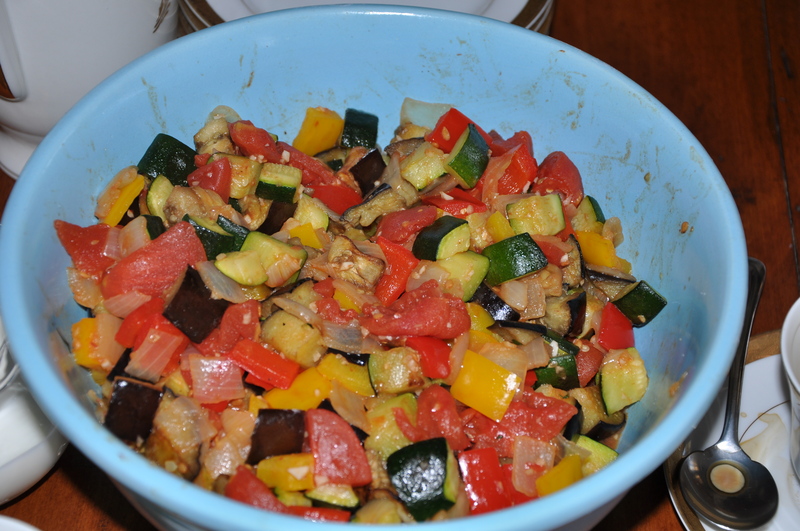 After the eggplant and zucchini are roasted to a turn, tumble the sauteed veggies together with them. 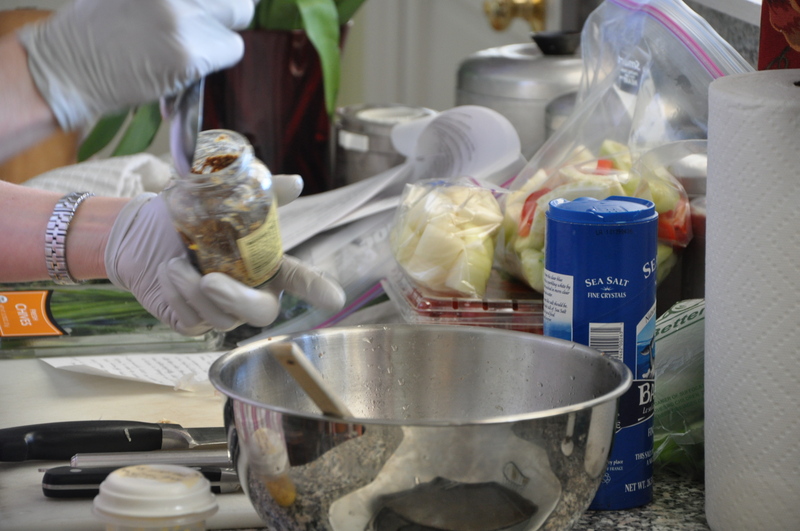 Once you've stirred the cooked ingredients together, pour into a serving bowl and pass it around. Folks will take seconds! 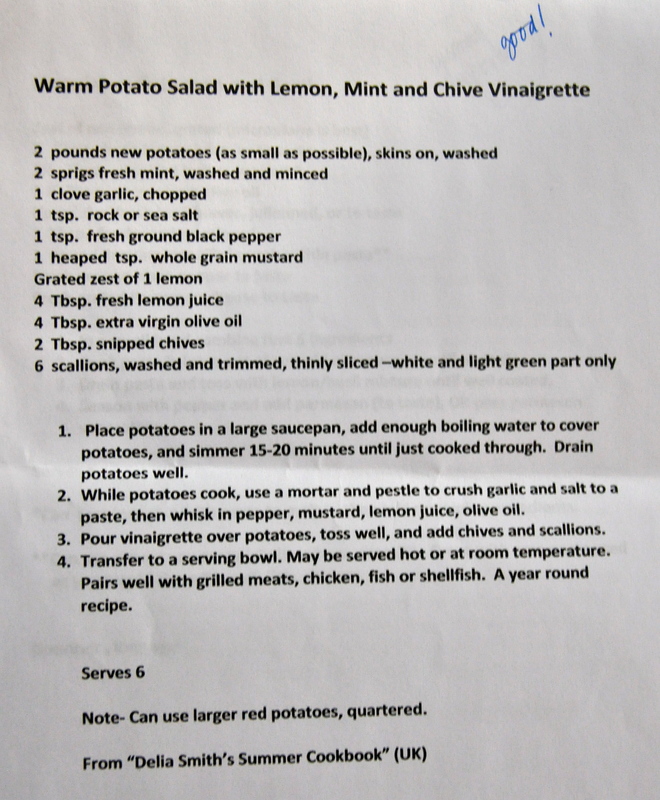 Next up was Warm Potato Salad with Lemon, Mint & Chive Vinaigrette. Make the dressing: Squeeze the garlic through a press and into the bowl. 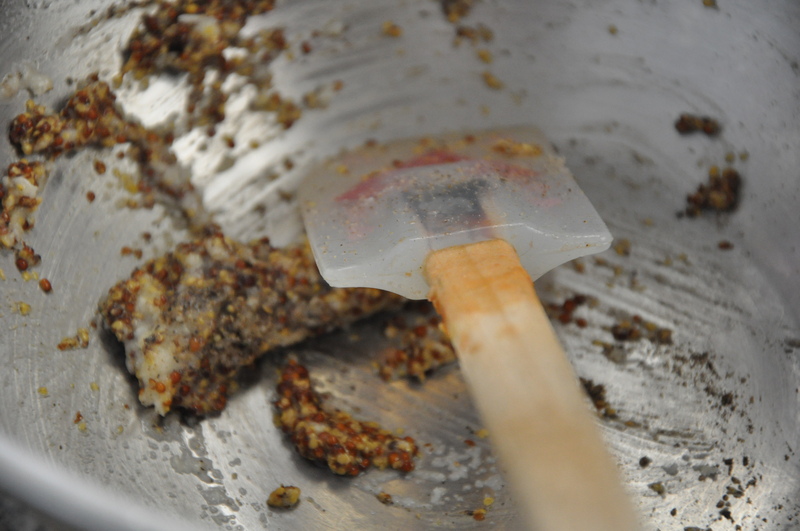 Add whole grain mustard, salt and pepper to the bowl. Add the zest of a lemon then stir. 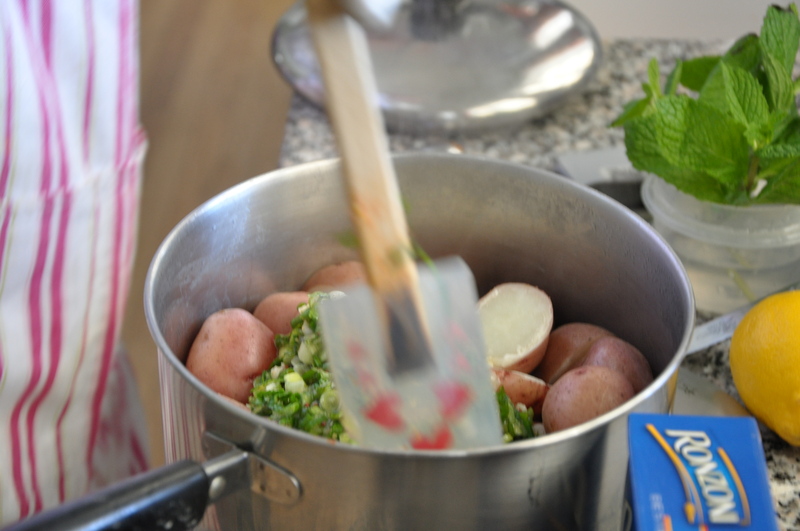 Chop the mint and add fresh squeezed lemon juice next. 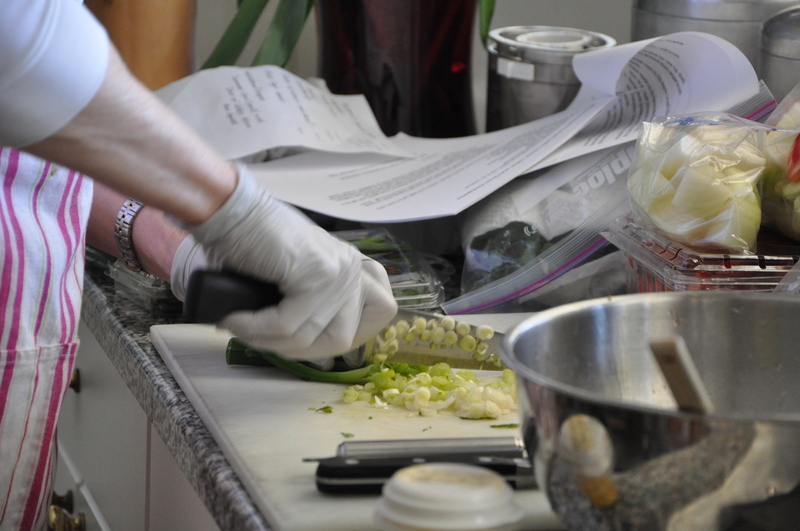 Then chop and add the scallions. 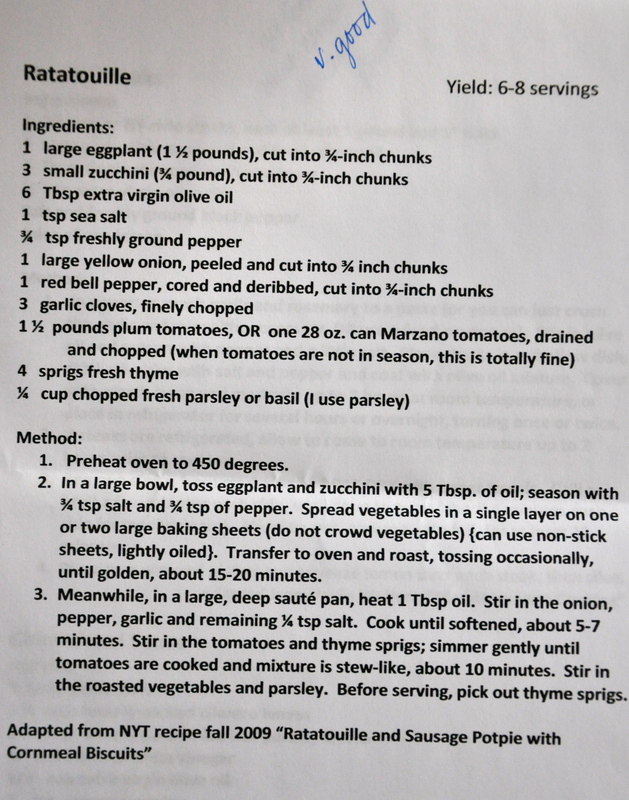 Since the chives were not the best, Deb didn't use them in the dressing today. 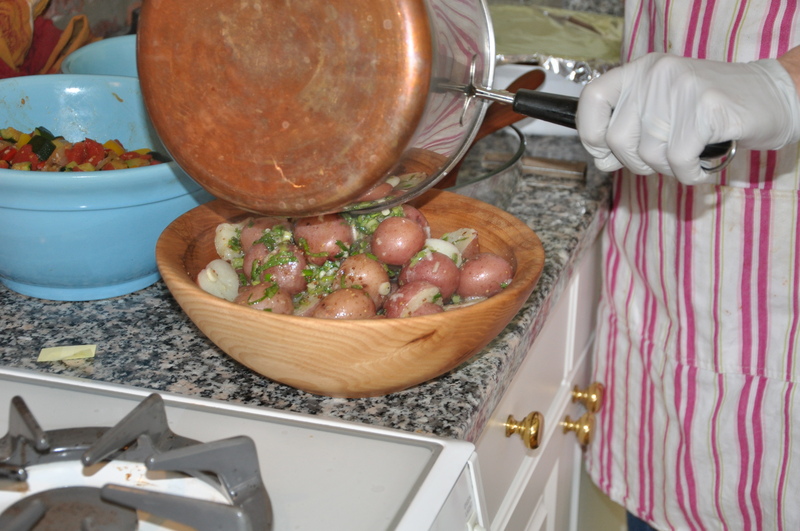 Mix the dressing into the still-warm potatoes. Serve it warm, serve it room temperature or serve it cold. Any way you serve it, it is delish! Check out the other excellent, easy recipes Debbie made today by clicking on “My World in Photos,” on the right side of your screen. You will find recipes for Butternut Squash Puree with Thyme, Linguini with Lemon and Basil, and Grilled Sweet and Spicy Shrimp with Mint Sauce. You’re stomach will be happy you did!